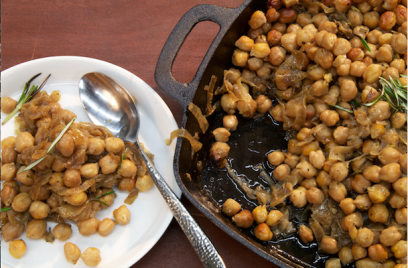 Two big time-savers include subbing in canned chickpeas (good quality, of course) for dried and making your caramelized onions up to 4 days ahead. Fresh chopped rosemary, olive oil and salt/pepper round out your shopping list for this one so seriously, give it a try – YOU WILL NOT BE DISAPPOINTED. i promise! Of course, when you have the time, it’s always good to start with dried beans and boil your own so I’ve included the boiling directions below. As I mentioned above though, it’s absolutely acceptable to substitute canned chickpeas here. Either way you go, remember to RESERVE either 2 cups of boiling liquid or 2 cups of the canning liquid to use in the recipe. It helps give an really nice, extra creaminess to the beans. And caramelizing the onions is easy to do especially with the oven method shared here. It’s honestly just a matter of setting aside the time to peel and slice the onions. The amount written may seem like more than you need but the thing is the onions really shrink down to a fraction of their original volume. Their sensational sugary, golden brown goodness infuses right into your chickpeas while they’re baking so they’re a KEY ingredient here. Just jump right in, start with one onion and they’ll just fly, you’ll be finished in no time! 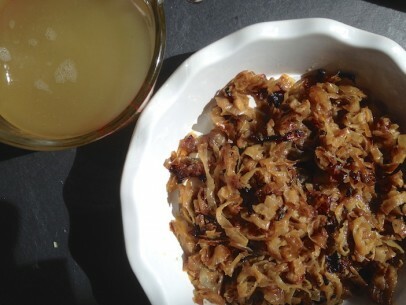 I often make extra caramelized onions with this recipe to keep for other uses such as eating all by themselves or topping sandwiches and salads. These little gems are the sweetest of savory sweet treats and you’ll find endless ways to enjoy them. Also, if you have your own preferred way of caramelizing onions, feel free to go ahead with it – a good friend swears by her slow cooker method! This is just mine but there are so many different ways out there, go with what you know. You can make the onions up to 4 days ahead and keep covered in the fridge until you’re ready to bake. A cast iron pan is a great option for this dish or, of course, the more traditional clay pot if you’re lucky enough to have one in your kitchen. The cast iron just heats every bean through to creamy perfection and I swear, it bakes the flavors of the the onions and rosemary right into each pea! Truth be told, this is a flexible recipe in terms of bakeware as I’ve used a regular old 9×13 cake pan many times with great results. Using canned chickpeas? Skip the next paragraph! Boil soaked chickpeas for 1 hour under tender. RESERVE 2 cups boiling liquid before draining. You can do this up to 3 days ahead and keep both cooked chickpeas and reserve liquid covered in the refrigerator. Layer bottom of casserole dish with caramelized onions and crushed rosemary, salt, pepper. Layer cooked chickpeas on top. Add reserved boiling liquid and oil. Stir gently to just combine. Try to leave onions on the bottom. Combine sliced onions, orange juice, olive oil and salt. Cook onions in baking pan at 400 degrees, covered tightly, for 1 hour. Uncover, stir and continue to cook with lid half off for another 2 hours. Stir halfway through. At end of 3 hours, stir onions and add a tbsp of brandy to deglaze the pan. You can store cooled onions covered in the refrigerator for up to 4 days. I have made a similar dish at home just sort of guessing at what peasant dishes would have naturally been vegan. This looks and sounds phenomenal – can’t wait to try it! Thank you so much for sharing these lovely, nourishing recipes. I just tried this–absolutely wonderful! I used a little less salt, and next time, would stir the onions more often–they really burned on the edges of the pot, even before the 2 hours was up. However, the taste was not harmed at all, only the pot, and the finished product was fantastic!! I made these and they were absolutely delicious, BUT, I should have checked on them during baking – everything in contact with the sides and bottom of my cast-iron pan burned. The middle was wonderful. I will definitely try again, but will probably lower the oven temp. Should I have been stirring every once in a while? This may be a really stupid question, but does the brandy go into the onions? Or are you saying that’s just something you pour on the empty pan to help clean it off? I ate this dish recently at a colleagues place and he said he made it with white wine as well. I can’t even out into words how good this dish was. The white wine and rosemary was a stunning marriage. Have you seen this version anywhere Kiki? And if so, can you please add it? I have made this 3 times in 2 weeks. It is AMAZING and so straightforward to make. I will admit to substituting thyme for rosemary, and cooking it all for only an hour or 90 minutes, do not exactly as described, but it comes out fabulousy well. Any left overs are wonderful with a squeeze of lemon cold, too. This will be making regular appearances on my table from now on – thanks. I’ve done this twice now, once accompanying a pork dish and last night on the Thanksgiving buffet. Wonderful! This is a “wow them” side dish and satisfying main for my vegan or vegetarian guests. I’m thinking of subbing home made vegetable stock for the boiling water or chickpea can liquid, but the dish is not short on flavor as is. To the contrary, it is rich, sweet, savory and satisfying. I let the top get dark and crusty/chewy – adds a texture layer that looks and tastes great! I also chop the onions a bit to complement the shape of the chickpeas on the fork, and found no need to deglaze with acid as the moisture in the browning pan was enough with a vigorous stir and scrape. It’s the morning after Thanksgiving and honestly… THIS dish is the leftover calling my name!! Thank you. Hi, Kiki. This sounds delicious, and I plan to make it this week, but I have a question, possibly a dumb one. Do you have to caramelize the onions beforehand? I am thinking that they will get caramelized during the 2-1/2 hours in the oven. Ah, makes sense. Thanks so much! I will be caramelizing onions tonight in preparation for this dish. Thanks, Kiki, for sharing this tasty recipe! It looks pretty straight forward to prepare and definitely a must to try soon! I am excited to find this recipe as I had it once at a friends place here in Evia. They told me they made it with white wine and fresh rosemary, and I swear the chickpeas took in all the flavors. It was hands down the best bean dish I ever ate. Thank you so much for giant beans recipe. I have made it about 3 times and it now one of my favorites. I am getting ready to try this recipe. It looks delicious, but I confused about fresh or dried rosemary. The text at the top and the picture show fresh, but the recipe itself says dried. Will you please clarify for me? Can this dish be made ahead of time and frozen and then be re-heated a few days later? Adrian, I would not freeze and reheat this dish. A better option to consider – caramelize the onions up to five days ahead of baking and then either boil chickpeas ahead up to three days or use canned, then simply combine chickpeas/rosemary/onions and bake when needed. hope this helps!